How are genetic “memories” passed on? Epigenetics is the study of inherited changes in gene expression…changes that are inherited, but they are not inherent to our DNA. For instance, life experiences, which aren’t directly coded in human DNA, can actually be passed on to children. Studies have shown that survivors of traumatic events may have effects in subsequent generations. The question, of course, is how are these genetic “memories” passed on? This is the question that a Tel Aviv University (TAU) was seeking to answer when they reportedly discovered the exact mechanism that makes it possible to turn the transference of environmental influences on or off. Their research was recently published in the journal Cell, and was led by Dr. Oded Rechavi along with a team of faculty members from TAU’s Faculty of Life Sciences and Sagol School of Neuroscience. According to their study, epigenetic responses that are inherited follow an active process as it gets passed on through generations. From there, scientists were able to determine that specific genes, which they dubbed Modified Transgenerational Epigenetic Kinetics (MOTEK) are also involved in turning epigenetic transmission on and off. 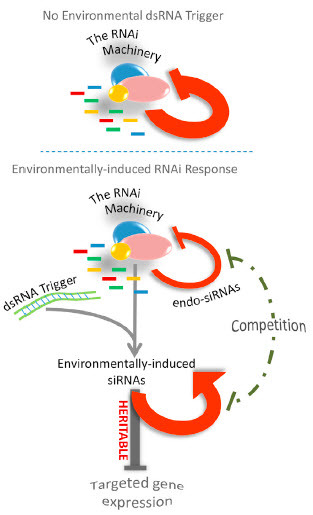 Switching on/off are based on the feedback interaction between RNAs (which are inherited) and the MOTEK genes that are necessary to producing and transmitting the RNA through each generation. The current study was conducted on worms, but understanding the principles behind the process of passing on epigenetic information will ultimately lend itself to a more comprehensive theory of heredity, especially for humans.